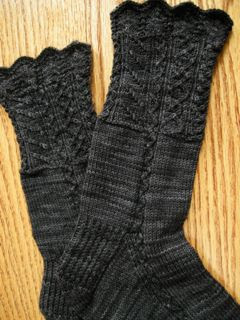 Here we have a second pair of the Travelers Stockings, from Knitting on the Road, by Nancy Bush. Again, I have used Tess' Sock Yarn, which is 80% wool and 20% nylon for strength, but this time in black. Have I mentioned that I LOVE this yarn? Well, I do. It is wooly enough that I like it, but strong enough to last. These will be perfect for my black wool slacks.